We have supported medical mission in the Democratic Republic of the Congo for many years. The individual workers come and go but the need continues. In 2011 we began supporting Ruth Brown, who works in public health to address the root causes of hunger in the Kasai region. Ruth serves as a development specialist with the leadership of the Presbyterian Community of Congo (CPC) focusing on food security issues. As a development specialist, she works with communities to address the root causes of hunger and poor health rather than just treat symptoms. Click here to see more information about her and read some letters that she has posted. At Ruth's request, Warner's support in 2012 is designated for PRODEK, a program she describes in her letter from May 31. As part of our concern about malnutrition in the Congo, we have supported the Moringa Tree Project since 2006. The moringa tree (originally from India) has extremely nutritious leaves that can be dried and used as a seasoning, resulting in a much healthier diet, especially for small children. The Moringa Tree Project encourages villages in the Kasai region to plant and use the moringa trees, with visible improvement in the nutrition of those villages. 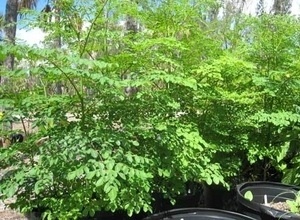 Click here to read more about the Moringa Tree. > Peter Graeff is an independent development program professional who grew up at Warner and has worked in Haiti for over 30 years. He has collaborated with a number of church-related organizations duing his career and is currently supporting communities in Port-Au-Prince and on the island of La Gonave. Warner has supported Peter's work throughout his time in Haiti. In recent years, we have contributed towards the tuition of several agricultural and nursing students, helped pay for repairs to homes damaged in storms, and sent relief funds and supplies to victims of the 2010 earthquake. Warner sent a mission team to Haiti in June 2011 to help with reconstruction efforts and to see first-hand some of Peter's current projects. Holly Ulmer, a Presbyterian minister and graduate of Princeton Theological Seminary, has served as United Campus Ministry's Chaplain at the University of Maryland since 1990. United Campus Ministry is a Christian chaplaincy that brings students together for fun, worship, study, music and service. Various programs provided by UCM include, but are not limited to: community service, crisis support, Sunday dinner meetings, weddings and premarital preparation, and other social events. Warner has served dinner at some of UCM's Sunday dinner meetings, and joined with Holly and a group of UMd students on a mission trip to New Orleans in 2008.